Today’s blog article was written by a person very special to me – my twenty-two year old daughter Hannah. Hannah normally so happy, energetic and optimistic has been through an incredibly stressful few years – good stresses and not so good stresses. Two days ago her beloved sixty-six year old grandfather Ted, died after a courageous battle with cancer. It’s been devastating for us all. Earlier this year a close friend took his own life. And these are only some of the things that have been knocking her around. No wonder she has been feeling depressed. Happiness comes from within, from within ones soul. When one is battling depression I would say the best first step is to be your own best friend. Don’t be hard on yourself about where you are. Sometimes when you are depressed you can be really focused on everything that you don’t think is right about you. I have decided to call these thoughts the Ra’s. Remind yourself of all the beautiful things that you still like about yourself. Mine, for example is my singing voice and that people positively comment that I am nice and tall and I have good looks, I’m intelligent and I do well at university. When you have depression often you have low self-esteem so perhaps keep a journal of the positive things people say about you or say positive things to yourself about your appearance and your personality. Step 2: Notice the beauty around you. The world is a beautiful place if one could only notice all the stunning things around that there are to see. Take moments in the day to practice mindfulness and take in the beauty of the things around you, the birds, the trees, the flowers, the fashion of people around you. Take pleasure in the small things most people would usually only glance over. Enjoy the local music in cafes or even do some people watching. It’s amazing what you can see when you take in your local surroundings. This also helps you to stay focused in the present rather than worrying about what happened in the past or what might happen in the future. Step 4: Exercise. Taking yourself out for a brisk walk can help a great deal to get the blood pumping. I know I feel so much better for just going for a walk with my iPod and getting out amongst the wind and into the sunshine. Step 5 – Meditate. Learning to quiet the mind and be in the now is a great practice to take up. Just spending 20 minutes a day can help a great deal with concerns of the mind and day to day worries. I have started going to a meditation class to learn and I’ve joined up with a friend who wanted to learn as well. It’s good because we are both encouraging each other. Step 6 – Journal. Writing down how you feel each day and keeping a mental note can be a really helpful practice. Keeping tabs on how you are going and where you could improve can help you to feel better about where you are at and where you need to be. In this journal keep a record of how your emotions are and perhaps write some goals. Step 7 – Keep active. Making sure that you are doing something with your days, keeping active and not allowing yourself to sit inside your own head is really important. Scheduling tasks and activities to get done is helpful. Still keep social even though you may not necessarily feel like being social. It’s really important not to isolate yourself. Step 8- Follow your passion. Still partake in the things that you are passionate about. Don’t forget to still be involved in your joys even though they may not necessarily feel like your joys at the time. Also it is still OK to do things alone. Step 9 – Soak up the sun. When you are depressed you often feel like staying inside, in bed, in the dark- anything but going out in the light, which is the very thing that you need to do to feel better. Vitamins from the sun are proven to make you feel better. Don’t forget solar power can light up houses, building and resorts. Just think what it can do for you! All I can say is that depression is not something that will last for ever and with good commitment to working on and practicing some of the steps above you can expect to be feeling much better and be on your way to recovery. Remember you’re a good special person who is simply going through a tough time, hang on to hope and be your best friend. I can’t think of a better love affair than to have a love affair with your self – your passions, your talents, your unique essence. What activities and/or special talents do you have that give you the most satisfaction? One of the most empowering things you can do for yourself is to define your criteria for life success. This requires reflecting on what the key elements are and the experiences you wish to have. What is success to you? For me success is being truly happy, authentic, free. Happiness is a state of mind. The Dalai Lama says that the very purpose of life is to seek happiness. He believes that if you train the mind to be happy, you will be. Likewise, you can train yourself for higher self-esteem. Some people affirm for what they want by writing in a journal how they want to feel for the day. Others work out the things that lead them to feel sad and find ways to remove these things – such as not watching the news. Others make a conscious effort to do something everyday that makes them feel happy. List at least 10 things that make you feel happy. What are some steps you can help yourself to feel happier? 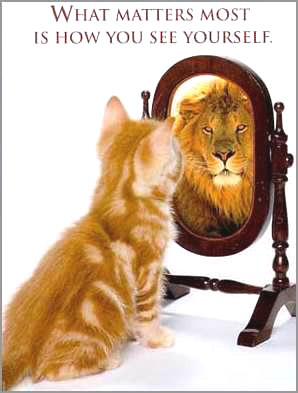 How much you like yourself is often reflected in the level of goals you will set for yourself. Generally, people who like themselves and feel valuable set higher and more challenging life goals. What would you do if you knew you could not fail? How could you make this goal a reality? If this feels daunting try setting mini-goals. When you live by a clear set of values, it is easier to align your life with what is most important to you. When you honour your core values, (those things you would fight for), you honour your true self. What are you doing now that is not congruent with your values? What steps could you take to “live” and “be” your values? People with high self-esteem seem to have a reservoir of energy, and seldom get sick or let life’s set-backs keep them down. Their energy and enthusiasm for life encourages them to take care of their body, mind, and spirit. What five things could you do this week that would make a positive difference to your energy levels? I know if I go for a walk, turn off technology, meditate, read something inspiring and eat healthily my energy soars – more so if I do something I am passionate about. Staying away from negative media and people also boosts my energy! Attitude determines your altitude. The more positive your thinking, the more positive your feelings, the more positive the outcome. There is nothing more powerful and creative than your thoughts, so you may as well make them positive and uplifting. Passion takes hold of you and feels like “fire in the belly”. It is a source of power that enables you to get fired about life and make a difference. The more passion and zest you feel, the more alive and brightly lit you are. Enjoy a daily tonic and make passion a regular event. Do you regularly spend time doing things you enjoy? Can you do something every day to help keep your passion alive? Only 15 or 30 minutes a day devoted to activities you love and that move you closer to your dreams can make a big difference to your health and happiness. If finding time or lacking energy is preventing you from doing more of the things you are passionate about develop a strategy to restore the balance. What things can you do to experience more passion in your life? When you know your life vision and purpose, life has more meaning and direction. Vision and purpose provide a sense that you matter, that you have a part to play, and that you truly belong here. What is your life purpose? Set yourself up for success by breaking big goals into daily action steps and take time to acknowledge and celebrate the small successes. This will feed your need for recognition and provides the extra push to keep you moving forward. What are some ways you can reward yourself? When you care about yourself, you make smarter decisions. You take care to choose the right mate, occupation, and lifestyle that support you. 14. Break free of the comfort zone! Humans are pre-wired to grow and develop. From the moment we are born we are set on an irreversible path of growth and exploration. Our fingernails keep growing, our skin heals when it is damaged – yet somewhere along the way some people tell themselves it is not okay to try new things. Trying to stifle this growth is a sure-fire way to limit your potential. How do you know what you are capable of until you try. How could you break free of the comfort rut? Circle 10 (or more) of your strongest positive qualities, or write in your own at the bottom! Post this in a prominent place where you live. Begin each day by reading your list and affirming all of your positive attributes. You may want to get a photo of yourself and write down all the things that are good about you beside it. Healing, growth and self-love come from embracing our flaws – those parts of our personalities that we may be told by others are our weakest links. The truth (sometimes) is that our greatest weakness can be our greatest strength (and vice versa). Growing up I was told my sensitivity made me weak – now my empathy and intuitiveness are valued by others as amongst my greatest strengths. Similarly I have been told my creativity is one of my greatest assets. During most of my childhood I was actively steered away from this. Go figure! What are you weaknesses? How could your weakness be a strength? How can you embrace it, cultivate it, own it – do something to help others with it? What is your Achilles heel – your spot of vulnerability that if you were to strengthen it could make you greater still? Everyone has had negative experiences that cause self-doubt. But faith in our ability to accomplish our goals can be re-enforced through affirmations. Repeating affirming statements is simply an acknowledgement of what you may already believe but may have come to doubt because of a bad experience. Think about a situation that might make you feel uncomfortable, hesitant, or even fearful. Maybe it’s making a phone call to a prospective employer to see if they have any vacancies or going for an interview. Whatever it might be, imagine yourself experiencing that same difficult situation in a way that you never have before – as your ideal self – confident, self-assured, at ease, etc. How do look in this fantasy? Describe yourself as you might look and feel.